. . . a collection restored for art in the classroom. 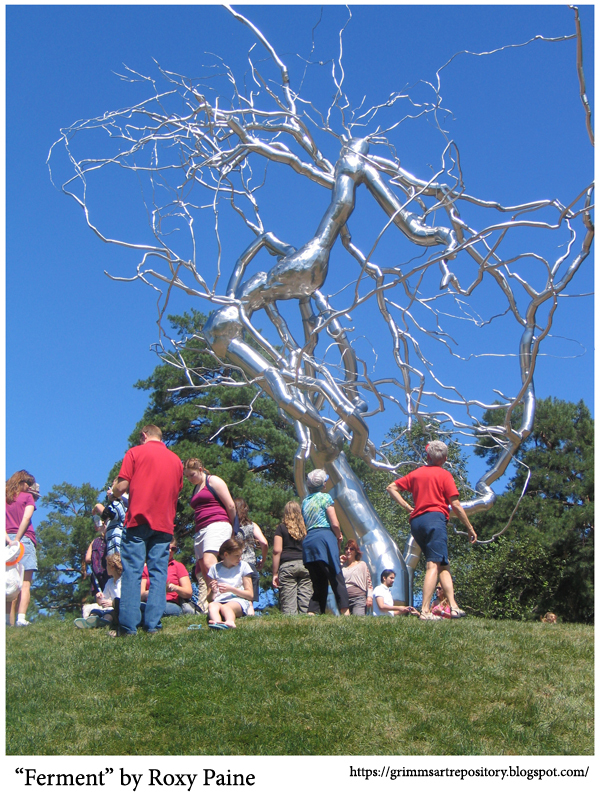 The first view of "Ferment" by Roxy Paine. 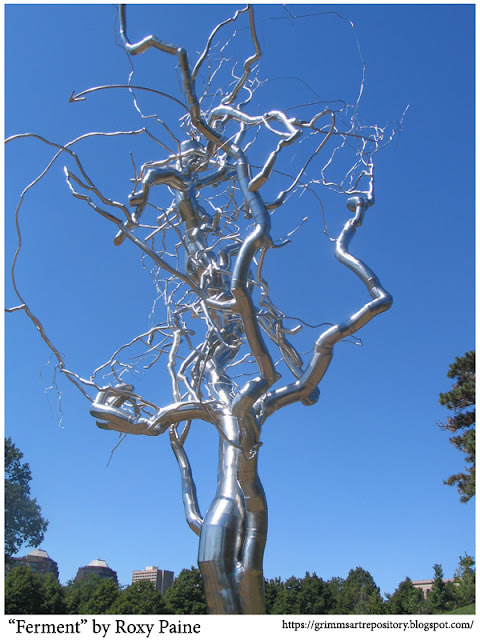 Roxy Paine was born in 1966, New York City and is an American artist. He was educated at both the College of Santa Fe (now Santa Fe University of Art and Design) in New Mexico and the Pratt Institute in New York. "Ferment" by Roxy Paine. A second view. 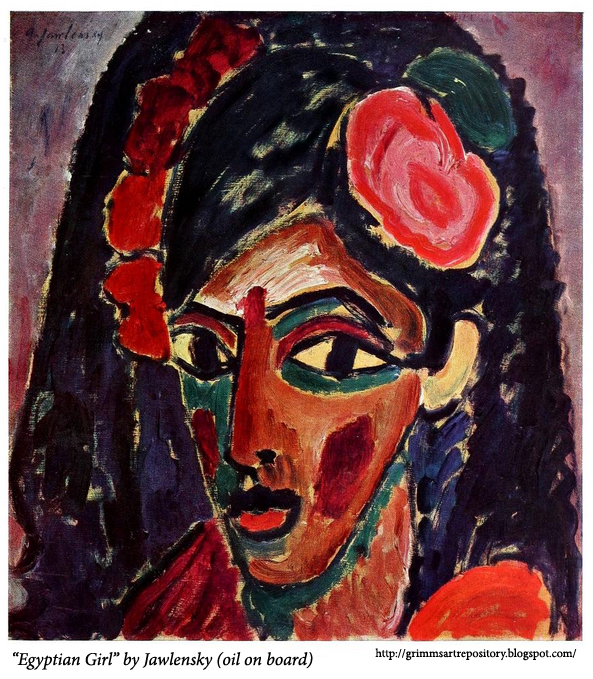 "Egyptian Girl" by Alexej Jawlensky. "The Muse Inspires the Poet" by Henri Rousseau. The above painting is of Guillaume Apollinaire and Marie Laurencin. Guillaume Apollinaire was a French poet, playwright, short story writer, novelist, and art critic of Polish descent. "Shuttlecocks" by Claes Oldenburg and Coosje van Bruggen at The Nelson Atkins Museum. 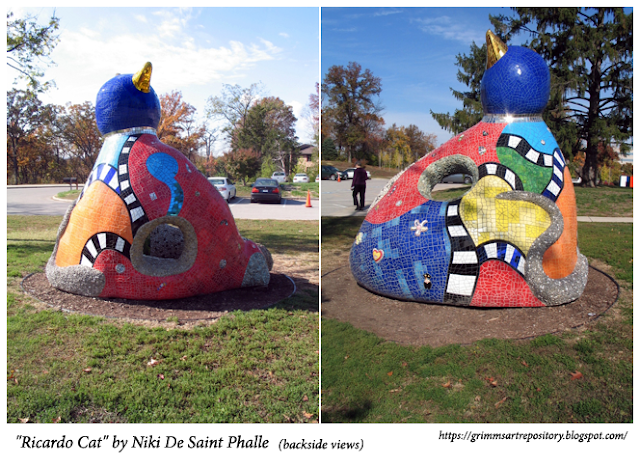 "Ricardo Cat" by Niki De Saint Phalle. Niki de Saint Phalle was born on the 29th of October 1930 and she died on the 21rst of May 2002. 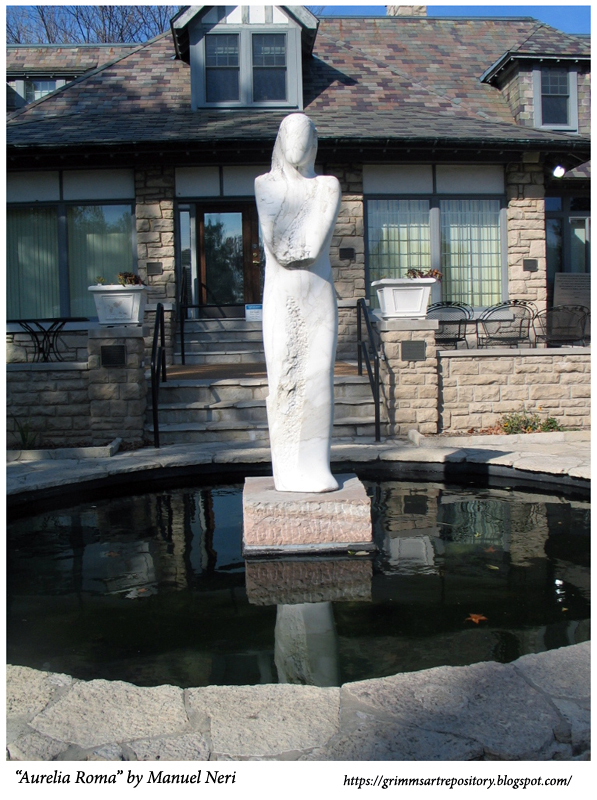 She was a French-American sculptor, painter, and filmmaker. She was one of the few women artists widely known for monumental sculpture. She had a difficult and traumatic childhood and education, which she wrote about decades later. After an early marriage and two children, she began creating art in a naïve, experimental style. She first received world-wide attention for angry, violent assemblages which had been shot by firearms. These evolved into Nanas, light-hearted, whimsical, colorful, large-scale sculptures of animals, monsters, and female figures. Her most comprehensive work was the Tarot Garden, a large sculpture garden containing numerous works ranging up to house-sized creations. 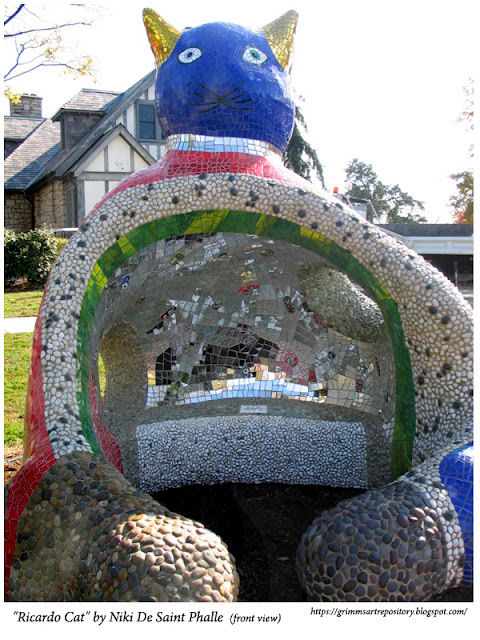 Her idiosyncratic style has been called "outsider art"; she had no formal training in art, but associated freely with many other contemporary artists, writers, and composers. 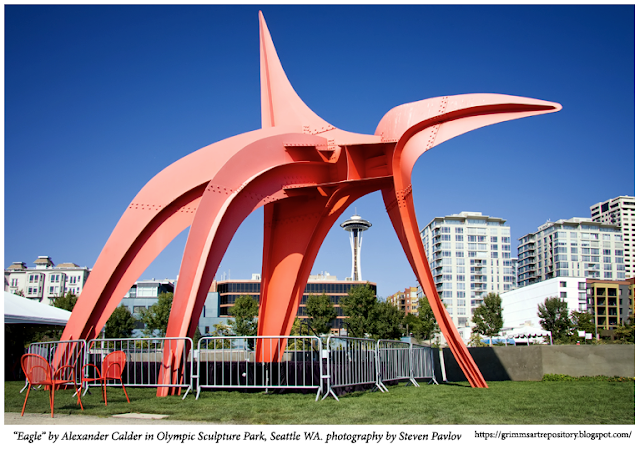 Backside views of "Ricardo Cat"
Inside and up-close views of Niki De Saint Phalle's "Ricardo Cat"
"Eagle" by Alexander Calder in the Olympic Sculpture Park, Seattle WA. photography by Steven Pavlov. Tony Tassset is an American multimedia artist. His works consists mainly of video, bronze, wax, sculpture, photography, film, and taxidermy. He has exhibitions that can be seen in Chicago, New York, Los Angeles, Germany, Canada, Portugal, Italy, Ecuador, and London. "Aurelia Roma" by Manuel Neri. 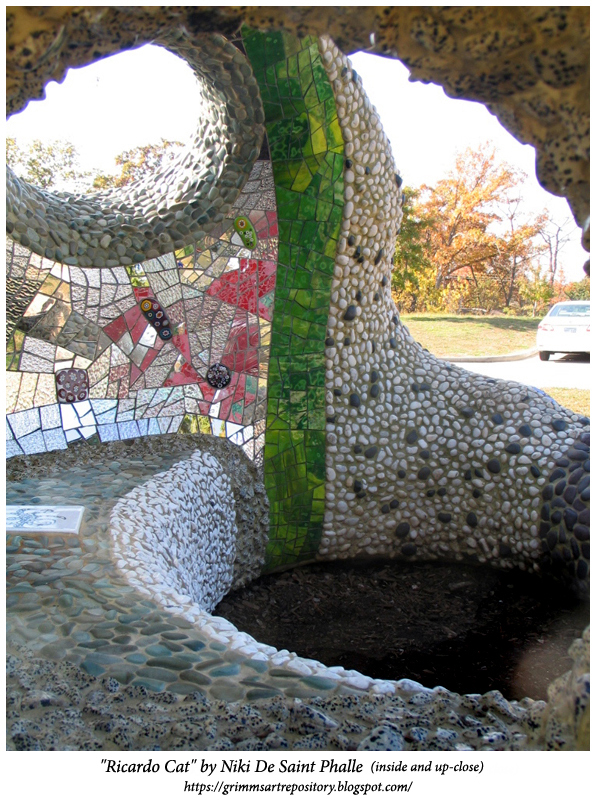 Laumeier Sculpture Park. 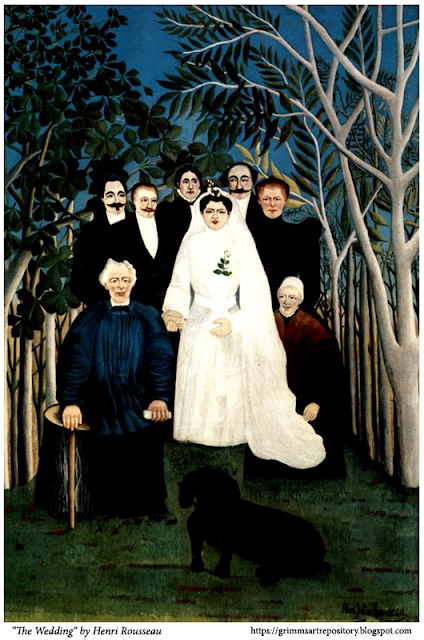 "The Wedding" by Henri Rousseau. Henri Rousseau, called Le Douanier , was born in Laval, Mayenne, France in 1844 and he died in 1910. Joined the Army when he turned eighteen and was assigned to play the saxophone in a regimental band. Served in the Franco-Prussian War, was discharged in 1871, and settled in Paris with Yadwigha, the Polish girl he had married in 1869. He got a job as a second-class clerk in the Customs Service, from whence came the nickname he has become known by, Le Douanier. Without any formal training, he began to paint in the 1880's. In 1886, in his early forties, he retired from the Customs Service on a small pension - which he supplemented by giving drawing and music lessons to the neighborhood children - and devoted most of his time to painting. He began submitting to the Salon des Independants in 1886, and exhibited regularly for the next twenty years without notice more favorable than ridicule. In 1905 he began exhibiting at the Salon d'Automne, and gradually attracted the attention of artists and writers like Gauguin, Derain, Vlaminck, Delaunay, Picasso, Apollinaire, Max Jacob, and Raynal. In 1907 he met Wilhelm Uhde, the famous art critic, who wrote the first monograph on him a few years later. In 1908 Picasso gave a banquet for him at the Bateau-Lavoir, and he was heralded as the pet of the avant-garde. The pleasure of success in his last few years was somewhat spoiled for him by personal difficulties, particularly the heartbreak of being turned down by a woman he wanted to marry. (He was already twice a widower.) He died of pneumonia on October 2, 1910, and was buried in a pauper's grave; his remains were later transferred to Laval, and an epitaph written by Apollinaire and engraved in stone by Brancusi and Orthiz de Zarate was placed on his grave. Henri Rousseau was an outstanding example of the Naive painter. Though untaught and ingenuous, he produced a remarkable body of work that includes scenes of family occasions, military events and sports, landscapes of Paris and its environs, bouquets of flowers and exotic and allegorical scenes such as "The Dream" and "Sleeping Gypsy." His paintings have won universal recognition, and are found in the Louvre and important museums of modern art throughout the world. 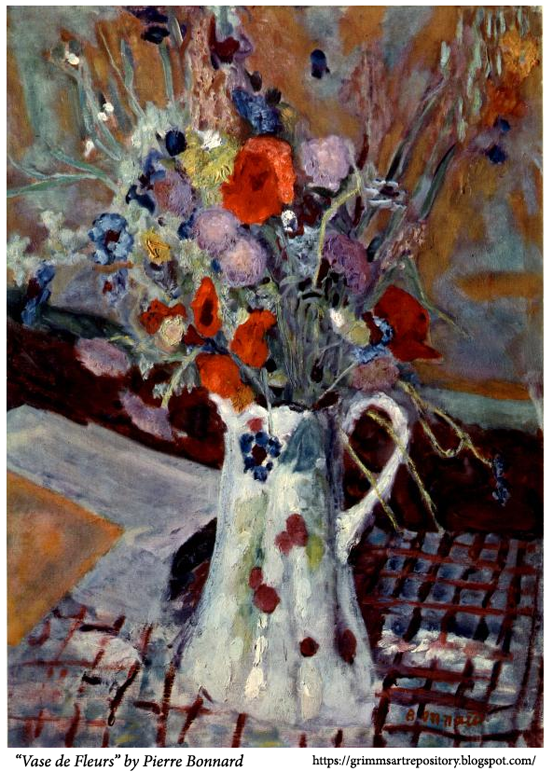 "Vase de Fleurs" by Pierre Bonnard. Pierre Bonnard was born in Born in Fontenay-aux-Roses, in the Ile-de-France, France in 1867 and he died in 1947. He studied at the Academie Jullian, where he met Vuillard, Maurice Denis, K. X. Roussel, and Serusier, with whom he participated in the Nabis. As a young student he was influenced by Degas, Renoir, Van Gogh, and Toulouse-Lautrec, and developed a great interest in Japanese prints. In 1891 he exhibited for the first time at the Salon des Independants and in group shows with the Nabis. Five years later he had his first one-man show of paintings, posters, and lithographs at Durand-Ruel's. During this period his lithographs appeared in the Revue Blanche and L'Escarmouche, as well as in a portfolio called Quelques Aspects de la Vie de Paris which Vollard published in 1895. He also worked on sets, costumes, and posters for the Theatre de l'CEuvre and the Theatre des Pantins and modeled marionettes for a play with music by his brother-in-law, Claude Terrasse. In 1900 Ambroise Vollard commissioned him to illustrate with lithographs Parellilement and Daphnis et Chloi. Both are masterpieces of graphic art. In 1903 Bonnard exhibited in the first Salon d'Automne and in the Viennese Secession show and subsequently participated in many important exhibitions in Europe and America. He also had a number of one-man shows in Paris, London, New York, and other cities. His style, at first decorative and subdued in color, became much freer and brighter after 1900. Transposing the universe into colors, he painted landscapes, still lifes, and nudes transfigured by a shining light. Revolting against the fashions and theories of his contemporaries, Bonnard went his own way. He was an extremely modest man and very hard on himself, but his work is characterized by a charming ever-youthful, good-natured cheerfulness and by an increasing audacity of color harmonies. In 1912 he bought a house at Vernnet, in the Seine Valley, not far from Paris, and subsequently divided his time between there and the south of France. He died in 1947 in his house in Le Cannet on the Cote d'Azur. "Lunch In Normandy" by Edouard Vuillard. his time. He died in La Baule in June, 1940, a short time after leaving Paris to escape the advancing Nazis. 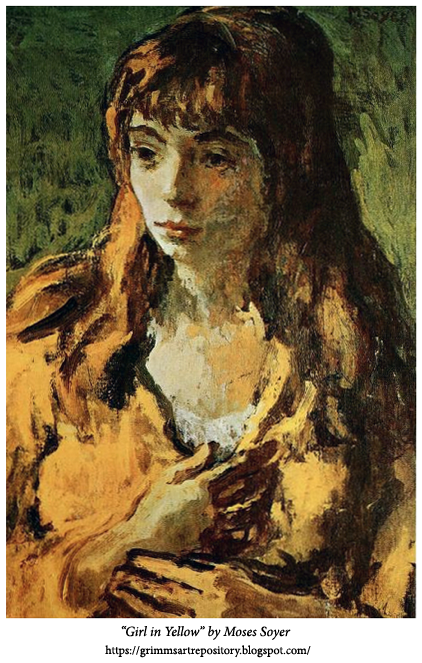 "Girl in Yellow" by Moses Soyer. Read an additional biography here. Moses Soyer (December 25, 1899 – September 3, 1974) was an American social realist painter. He was born in Borisoglebsk, Russian Empire, in 1899. His father was a Hebrew scholar, writer and teacher. His family emigrated to the United States in 1912. Two of Soyer's brothers, Raphael (his identical twin) and Isaac were also painters. Soyer's wife, Ida, was a dancer, and dancers are a recurring subject in his paintings. Soyer studied art in New York, first at Cooper Union and later at the Ferrer Art School, where he studied under the Ashcan painters Robert Henri and George Bellows. He had his first solo exhibition in 1926 and began teaching art the following year at the Contemporary Art School and The New School. He died in the Chelsea Hotel in New York while painting dancer and choreographer Phoebe Neville. 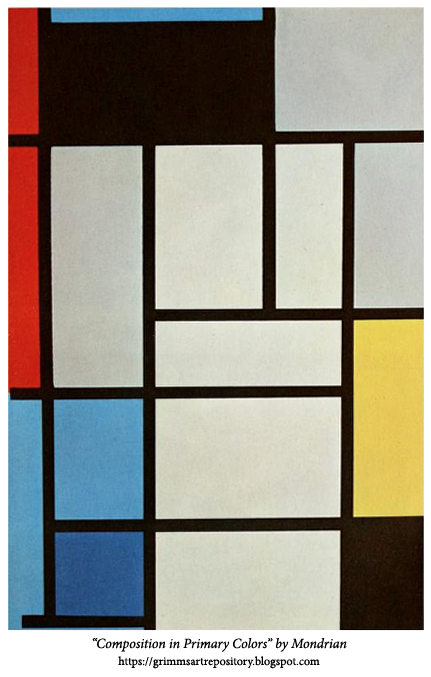 "Composition in Primary Colors" by Piet Mondrian. Piet Mondrian (1872-1944) was born in Amersfoort, Holland. He studied to be a teacher, then decided to be a painter instead, and in 1892 enrolled in the Academy of Amsterdam. From 1895 to 1907 he painted naturalistic landscapes in delicate but rather dull colors, then a stay at Dombourg on the island of Walcheren in 1 908 changed his manner and brightened his palette. 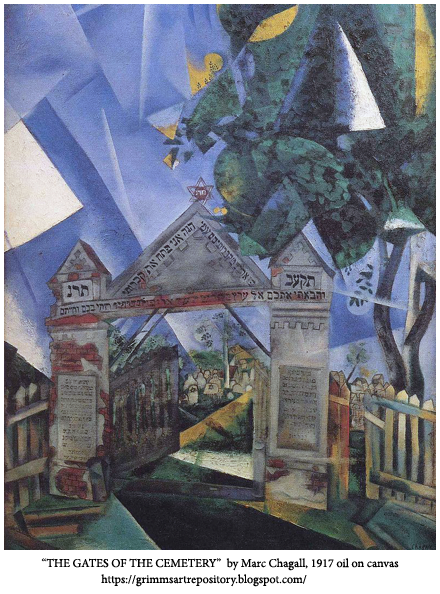 He arrived in Paris in 191 1, where he was influenced by Cubism and inclined toward abstraction. He spent the war years in Holland, continuing his experiments with abstraction until in 1916 he produced openly non-figurative paintings, rhythms consisting of horizontal and vertical lines which later became known as the "plus and minus" series. While in Holland, he became the center of a group of artists interested in geometrical proportions as the basis of art. With Theo van Doesburg, a member of this group, Mondrian founded an art magazine called De Stijl, which gave its name to the group and in which its ideas of Neo-Plasticism were set forth. Mondrian elaborated on these theories in his book LeNeo-Plasticisme, published in 1920 after his return to France. In Paris he became a member of the Circle and Square Group and, later, of the Abstraction-Creation group. He participated in large international exhibitions of abstract art in Paris and the United States. He lived in London from 1938 to 1940, then came to New York, where he was very warmly received, and had two exhibitions at the Valentine Gallery in 1 942 and 1 943 . He began painting in the more exuberant mood of "Broadway Boogie-Woogie," which is still geometrically abstract but uses bright, garish color in insistently repeating patterns that suggest the jangling pulse of Times Square at night. Since his death at Murray Hill Hospital in February, 1944, important retrospective exhibitions of Mondrian's work have been held at the Museum of Modern Art in New York, the Whitechapel Gallery in London and the Municipal Museum at The Hague. His canvases, which inaugurated a new style, are in the principal museums of modern art throughout the world. "Boum Boum Bird saying it's prayer at the onion skin head" by Joan Miro'. MIRO, Joan Born in Montroig, Catalonia, Spain, April 20, 1893. Studied at the School of Fine Arts and the Gali Academy in Barcelona. 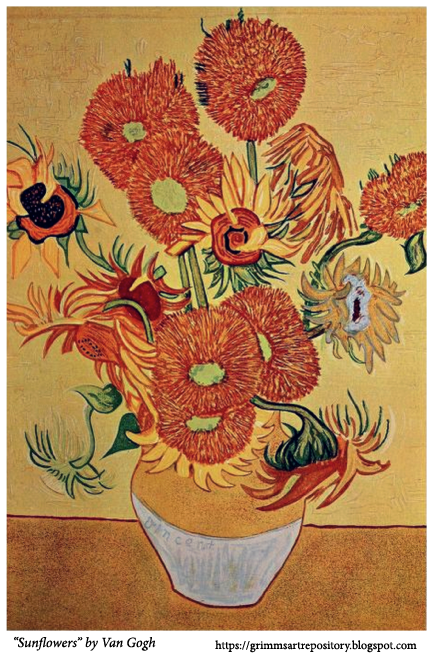 Had his first exhibition at Dalmau's in Barcelona in 1918, at which time he appeared to have been influenced by Van Gogh. Arrived in Paris in 19 19. Met Picasso and painted a series of Cubist still lifes. Had his first Paris exhibition at the Galerie Licorne in 1921. An anarchist, opposed to all rules and tradition, he discovered a kinship with the Surrealists. In 1924 he signed his first Surrealist picture "Terre Labouree," and, in 1925, participated in the exhibition of this group at the Galerie Pierre. 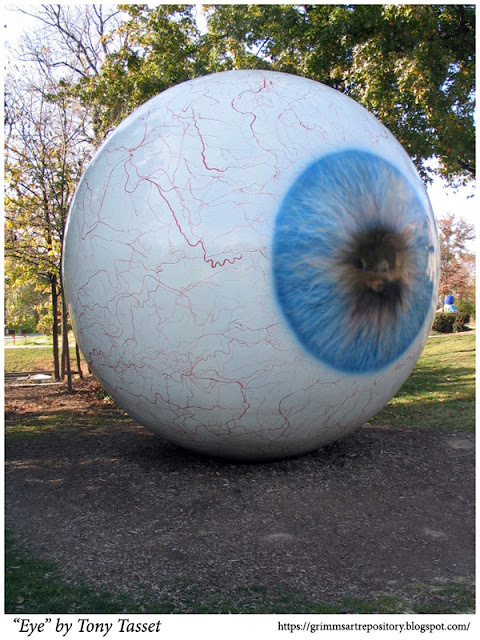 Since then he has been considered one of the foremost representatives of Surrealism. With Max Ernst, he designed decors for the Ballets Russes production of Romeo and Juliette, and in 1 93 1 he did dehors for Jeux d'Enfants for the Ballets de Monte Carlo. In 1937 he painted a large mural for the Spanish Pavilion of the International Exposition in Paris. 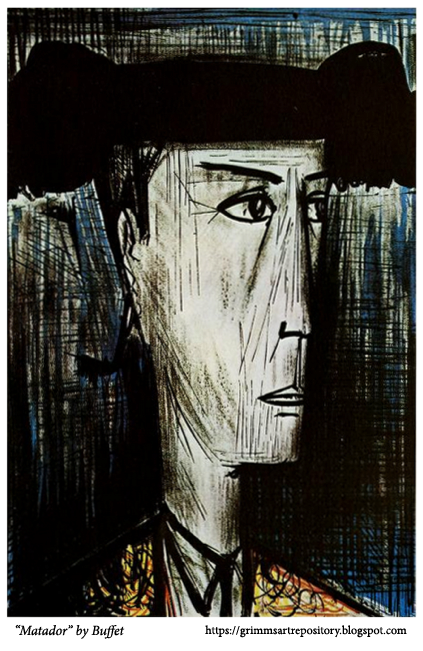 Forced by the war to return to Catalonia in 1940, he continued to paint, took up lithography, and collaborated with Artigas in the production of ceramics. He returned to France in 1944, and has since divided his time between Paris and Barcelona. He visited the United States in 1947 and executed a large mural for the Plaza Hotel in Cincinnati. 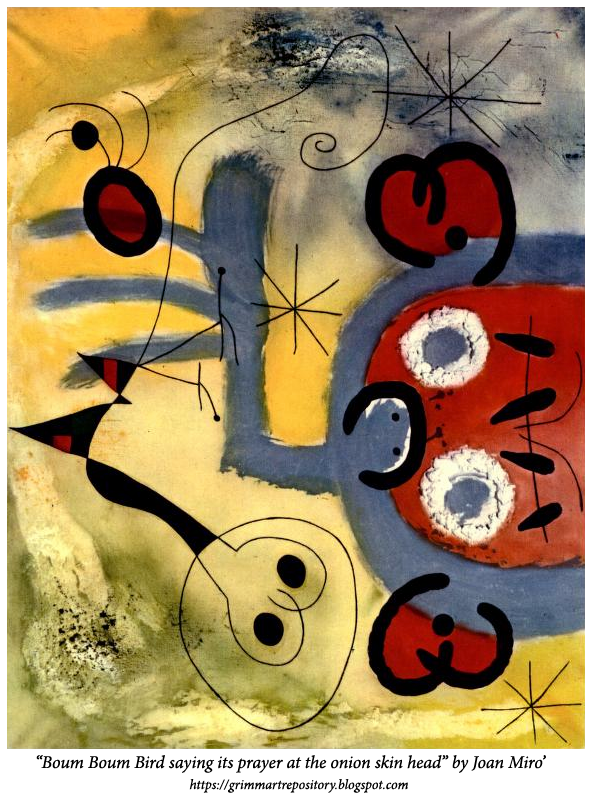 Miro is represented in most of the museums of modern art throughout the world. Born into an upper-middle-class family, Van Gogh drew as a child and was serious, quiet and thoughtful. As a young man he worked as an art dealer, often travelling, but became depressed after he was transferred to London. He turned to religion, and spent time as a Protestant missionary in southern Belgium. He drifted in ill health and solitude before taking up painting in 1881, having moved back home with his parents. His younger brother Theo supported him financially, and the two kept up a long correspondence by letter. His early works, mostly still lifes and depictions of peasant labourers, contain few signs of the vivid color that distinguished his later work. In 1886, he moved to Paris, where he met members of the avant-garde, including Émile Bernard and Paul Gauguin, who were reacting against the Impressionist sensibility. As his work developed he created a new approach to still lifes and local landscapes. His paintings grew brighter in colour as he developed a style that became fully realised during his stay in Arles in the south of France in 1888. During this period he broadened his subject matter to include olive trees, cypresses, wheat fields and sunflowers. 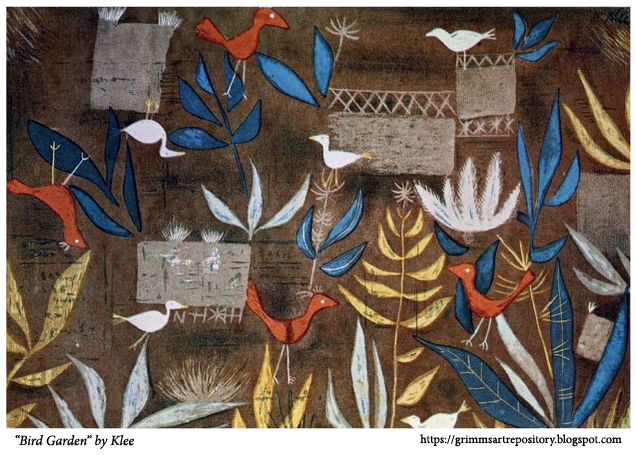 Paul Klee was born 18 December 1879 and died on the 29th of June 1940. He was a Swiss-German artist. His highly individual style was influenced by movements in art that included Expressionism, Cubism, and Surrealism. Klee was a natural draftsman who experimented with and eventually deeply explored color theory, writing about it extensively; his lectures Writings on Form and Design Theory (Schriften zur Form und Gestaltungslehre), published in English as the Paul Klee Notebooks, are held to be as important for modern art as Leonardo da Vinci's A Treatise on Painting for the Renaissance. He and his colleague, Russian painter Wassily Kandinsky, both taught at the Bauhaus school of art, design and architecture. His works reflect his dry humor and his sometimes childlike perspective, his personal moods and beliefs, and his musicality. Sustained by the picture-dealer Maurice Garnier, Buffet produced religious pieces, landscapes, portraits and still lifes. In 1946, he had his first painting shown, a self-portrait, at the Salon des Moins de Trente Ans at the Galerie Beaux-Arts. He had at least one major exhibition every year. Buffet illustrated "Les Chants de Maldoror" written by Comte de Lautréamont in 1952. In 1955, he was awarded the first prize by the magazine Connaissance des arts, which named the 10 best post-war artists. In 1958, at the age of 30, the first retrospective of his work was held at the Galerie Charpentier. On 12 December 1958, Buffet married the writer and actress Annabel Schwob. His daughter Virginie was born in 1962, and later, daughter Danielle in 1963. His son Nicolas, was born in 1973, the same year that he was named "Chevalier de la Légion d'honneur". At the request of the French postal administration in 1978, he designed a stamp depicting the Institut et le Pont des Arts – on this occasion the Post Museum arranged a retrospective of his works. He created more than 8,000 paintings and many prints as well. 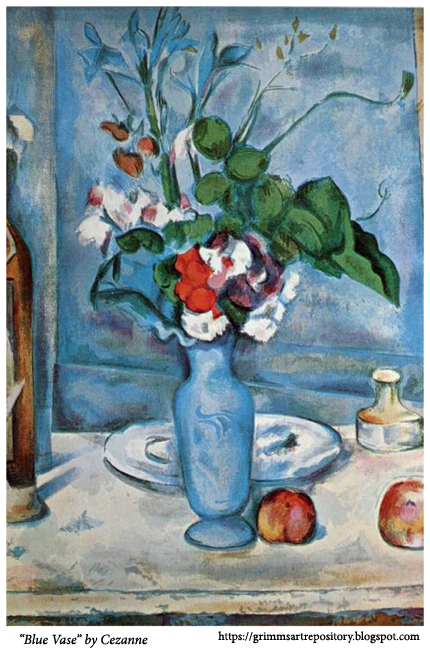 "Blue Vase" by Paul Cezanne. Paul Cézanne was born on the 19th of January 1839 and died on the 22nd of October 1906. 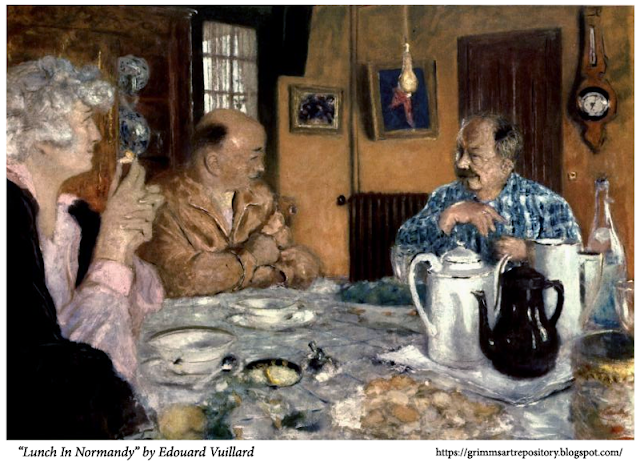 He was a French artist and Post-Impressionist painter whose work laid the foundations of the transition from the 19th-century conception of artistic endeavor to a new and radically different world of art in the 20th century. Cézanne's often repetitive, exploratory brushstrokes are highly characteristic and clearly recognizable. He used planes of color and small brushstrokes that build up to form complex fields. The paintings convey Cézanne's intense study of his subjects. Cézanne is said to have formed the bridge between late 19th-century Impressionism and the early 20th century's new line of artistic inquiry, Cubism. Both Matisse and Picasso are said to have remarked that Cézanne "is the father of us all." "The Gates of The Cemetery"